9.19 million people received some kind of state or federal benefits in the week of Dec. 25, on an unadjusted basis. That would account for people well over the extended benefit levels. Yeah, but did you see Obama’s SPEECH last night? Oh my Gawd, it was soooo unifying. Its reports like this that drives the debate against the Government, it needs to be ban or someone will get killed. Its Palin’s fault. After-Christmas layoffs...no real surprise here. Is it me? (probably) But all the hysteria over the improved Dec. hiring, and now “Unexpected” first time claims. Could it be anything to do with Holiday shopping hiring and firing come Jan.? p.s. also note the oh so predictable revision of last weeks numbers UP! sad, who do they think they are fooling! Exactly who cares that the country is still in the sh!tter, Gabby opened her eyes!111! Yeah, but did you see Obamas SPEECH last night? Oh my Gawd, it was soooo unifying. Too much jive, not enough thrive. Continuing claims retreated sharply to 3.88 million from 4.13 million, a potentially encouraging sign. Still looking for that pony in the poop, eh, Reuters? The unemployment numbers are beginning to remind me of a freight train in an old fashioned switching yard. Nothing appears to be happening (no changes in the numbers) followed by a sudden forward movement (unexpected increase) followed by some backward drift (slight improvements) as inertia attempts to return to its initial conditions. The problem in the freight yard, like our economy, is sudden and irregular application of movement. Until the train leaves the restrictions of the switch yard and is allowed to run free nothing good can happen. My question is when will the switch man (Obama and his czars) let the economy run free? BTW - the size differential between a man and the freight train was chosen to show just how little Obama and his czars are when compared to the rest of the nation and its economy. U.S. jobless claims jumped unexpectedly last week to their highest level since October, suggesting the labor market is still in a rut despite signs of improvement in the economy. The number of Americans filing for first-time unemployment benefits rose to 445,000 from an upwardly revised reading of 410,000 in the prior week, the Labor Department said on Thursday. It was the biggest one-week jump in about six months, confounding analyst forecasts for a small drop to 405,000. Every time these figures are announced, it brings into question their validity. How much back room manipulation goes into these compilations? Funny. "Each week" the "Experts" feed us another line of bs telling us how much better our economy is getting and how few jobs they expect to remain intact over the next week and each week, when the numbers come out, MAGICALLY they always end up "UNEXPECTEDLY" being higher than the week before. 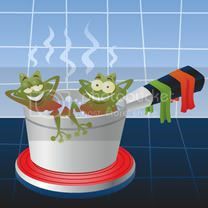 Am I the only one that is feeling the heat or is everyone in the pot of ever increasing hot water enjoying themselves?